I'm not an experienced Linux user. But I use Ubuntu (after trying redhat and Fedora) since it's supposed to be (Linux for human beings). I have both Vista yes :( and Ubuntu on the same machine. And I regularly need to access ntfs file system with windows files when using Ubuntu. When I open the file system from nautilus, I get this message, and I have to enter the root password. This is very annoying. And although the prompting for the password can be suppressed (but this is another story). The real issue is that the file system is not automatically mounted when the system starts up. 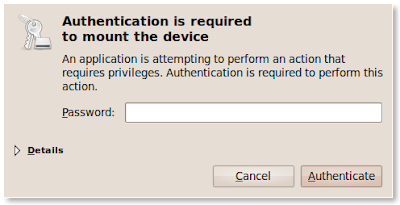 This means that when using an application that needs to access the hard drive (virtual box for example). I have to open the drive from nautilus first. So the solution is to edit the /etc/fstab file that contains the information needed to mount volumes on startup. And finally, I'm happy ! !